Last night, Trevor Hoffman recorded his 600th save in the Brewers 4-2 victory over the slumping Cardinals. In addition to being the first man to reach the 600 save plateau, Hoffman also extended his record holding margin to 45 saves over Mariano Rivera. In reality, however, the two relievers are really miles apart. While Hoffman is winding down his long career, Rivera is still going strong (his current ERA+ of 377 would be the best of his career), so it seems likely that the Yankees’ Sandman will eventually take over as the all-time saves leader. At the age of 40, however, nothing is guaranteed for Rivera, so each save that Hoffman tacks on could very well strengthen his grip on the record (even though Rob Neyer thinks he should settle on a nice round number). None of that really matters though. Mariano Rivera is the best reliever of all time and a clear cut first ballot Hall of Famer. Although a borderline candidate for the Hall of Fame himself, Hoffman is simply not in the same class. 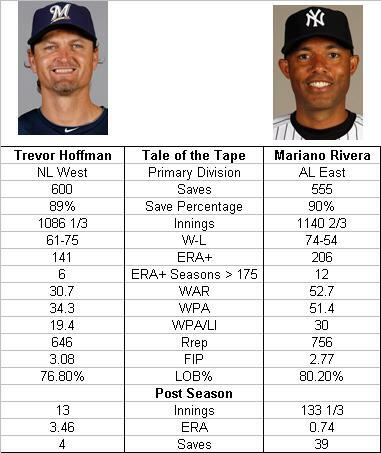 As illustrated in the “tale of the tape” below, a comparison of Hoffman and Rivera is quite a mismatch. It’s fine to use Hoffman’s milestone achievement as a starting point for discussion about his Hall of Fame merits, but Mariano Rivera’s name would be best left out of that conversation. There really is no comparison. As Sparky Anderson might say, “you don’t ever compare anybody to Mariano Rivera. Don’t never embarrass nobody by comparing them to Mariano Rivera”. That playoff ERA balloons up to well over 5 if we add in the one-game tie-breaker vs. Colorado in 2007, which I’d say is more of a playoff than regular-season game. Five batters faced in the 13th, three extra-base hits, a walk and the game-winning sac fly for the third run. Hoffman hasn’t been great in the playoffs, but in fairness, he hasn’t had as many chances. The comparison does, however, illustrate just how great Mariano has been in the post season. His post season numbers are astonishing…and they are very relevant in the equation. I also thought about including Hoffman’s 8.53 ERA in the All Star Game compared to Rivera’s 0.00 ERA, but figured I’d exclude exhibitions. I am a huge Yankee fan who lives 20 miles south of Milwaukee. My father was a Yankee fan since he was a boy and listened to their games on the radio on the farm and I have followed suit in a more sophisticated way…going to the games when the Brewers were in the AL, making the trip to Yankee Stadium every so often and now watching on D-TV. Maybe outside of the San Diego area, is there really anyone who closely follows the game who thinks that Trevor has had a better career than Mariano? Does anything more than a very small minority of baseball fans think that Trevor’s 600th save has made him as good, or better than, Marino? My point is, I don’t get the blog other than some kind of insecurity on your part or not being able to let your ego go for one day. From observing Trevor in Milwaukee the past two years the one thing he is above all is classy. Classy x 10. From what I have read, he was a class act in San Diego. Man, his ex-Padre teammates from two years ago were watching his accomplishment and were thrilled for him. What happened last night was not about who is the greatest closer of all time, but about a great guy being the first to accomplish something that hasn’t been done in baseball before. That’s it. A night of celebration. You must be one of the only people who appreciates the game to bash him less than 24 hours after his accomplishment. You probably don’t think you bashed him, but that statistical analysis you went out of your way to present is a bash. Stating Marino is milesbetter is a bash. The good thing is an equally classy guy in Marino will pass Trevor one day. And you know what, Trevor will likely celebrate it. My guess is you might post another blog like this. Does anyone who “closely follows the game” think Hoffman is better than Mariano? Of course not, but most people do not follow the game closely. On both Mike and Mike in the morning and the MLBN, reports of Hoffman’s 600th save included mentions of he and Mariano Rivera in a context that implied similarity. I am sure many casual fans who only look at the saves category also feel the same way. THAT is the point of the post. Furthermore, my point isn’t that Rivera is better…it is that Rivera and Hoffman are in different leagues. Just because they both play the same position have alot of one particular stat doesn’t mean they should be tied together. As for insecurity or ego, I have no idea how this post deals with either, unless you think it was really written by Rivera himself. I am sorry you think a statement of facts is a “bash” (a silly claim because I did state Hoffman is a borderline candidate for the Hall of Fame), but so be it. OK. Writing an article stating that they are not in the same league about as soon as you possibly could still is awfully tough. Something had to drive you to go to such lengths to show Mariano’s superiority which most us know already, even Mike and Mike. They likely got carried away for a moment. Make no mistake, I do not think Mariano wrote your blog. Mariano is also gracious and classy to the ten’s. I am sure even he tipped his cap, was happy for Trevor and would never seperate himself from him. Look at his interview when he spent time with Papplebon and other young closers at the All-Star game at Yankee Stadium. He was humble. The point of my post is just for a day an athlete who sets a milestone that has not been accomplished should be honored, not stoned. “Not in the same league…” is stoning.